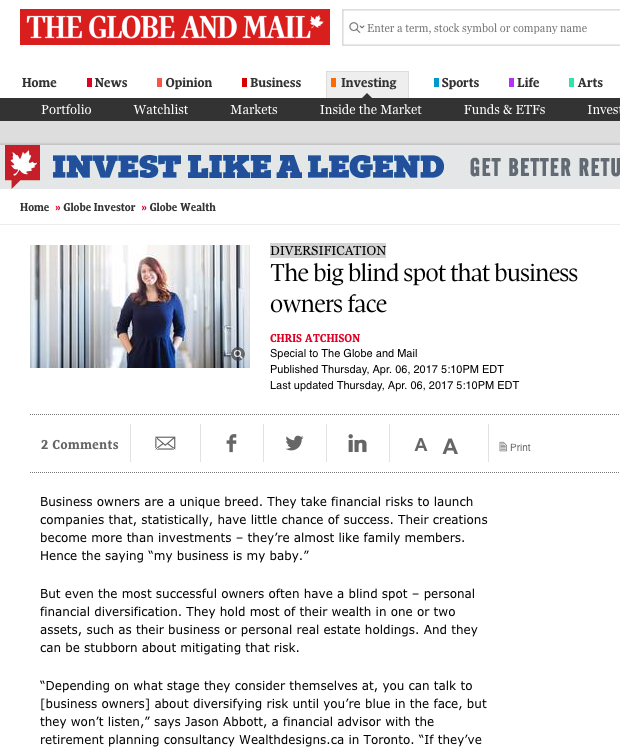 But even the most successful owners often have a blind spot – personal financial diversification. They hold most of their wealth in one or two assets, such as their business or personal real estate holdings. And they can be stubborn about mitigating that risk. While that may, at times, be true, a non-diversified asset mix invites major personal financial risk. Why? Businesses are cyclical, and recessions, structural changes in an economic sector and technological upheaval can shrink market share virtually overnight. Consider autonomous vehicles, which are poised to transform transportation logistics in the next decade (or sooner). Or the ongoing automation of the manufacturing sector. While many business owners will seize opportunities to build greater wealth with these tech-driven seismic shifts, others will be left behind, possibly to their personal financial detriment. As any investment advisor will stress, putting all of one’s financial eggs in one asset basket is a recipe for disaster. Business owners can reduce risk by holding a variety of investments unrelated to their field of expertise. Business owners face risk when it comes time to sell their “baby,” too. While stories abound of Silicon Valley entrepreneurs selling their tech startups and riding off into a gloriously wealthy sunset, those cashouts are rare, particularly among service businesses that lack proprietary technologies. According to Statistics Canada, more than three-quarters of the 1.17 million small and medium-sized businesses in this country operate in the service sector. Because service businesses in which the proprietor plays a key role are difficult to sell, most Canadian business owners cannot expect a major windfall from a sale. Ms. Simmons regularly advises entrepreneurs to explore financial diversification through registered retirement savings plans (RRSPs) and tax-free savings accounts (TFSAs). She says many CEOs work with their accountants to develop tax-friendly strategies such as paying themselves dividends from their corporations – at low corporate tax rates – into their personal registered accounts, which helps to shelter them from higher personal income-tax rates. Non-registered investments such as stocks and mutual funds also can play a role in creating a balanced portfolio that delivers long-term financial security. Mr. Abbott helps entrepreneurs skeptical about diversification understand their risk exposure by what he calls “crash testing” their financial situation. What would happen if their business ran into a major financial hurdle such as an economic downturn or an illness that took them away from the business for a protracted period of time? Would they be able to keep things afloat? Ultimately, a comprehensive financial diversification strategy should be dictated by an entrepreneur’s personal and professional goals. Business owners should assess everything from their spending habits and family commitments to retirement plans before developing a diversification plan, says Graham Bodel, director of the Vancouver-based investment management firm Chalten Fee-Only Advisors Ltd.
Whatever the circumstances, Mr. Bodel urges entrepreneurs to take a counterintuitive approach by investing outside of their core industry. “The number one thing if you’re thinking about diversification with investments, whether you’re using mutual funds or single stocks or whatever, recognize that a huge amount of your invested and human capital is already focused on a particular sector or subsector,” Mr. Bodel says.